A Hard Days Night – Do you speak Autism? I’ve taken a short break from writing my blog recently as life has been incredibly busy, and because the sun has been shining! But I’m happy to say that I intend to start posting regularly again. This weekend, my husband Matt and I are enjoying the rare luxury of a short break away without the children. But we are going with a specific purpose- other than the obvious, i.e. getting an uninterrupted night’s sleep and- dare I say it- an unheard of lie in. We are going to the Autism Show in Manchester. I’m hoping we will discover lots of new ideas for helping James’ development, in particular, to get some advice on sleep solutions. To say that James is a poor sleeper is putting it mildly. It is well documented that autism and sleep disorders go hand in hand, although there are different theories as to why this might be the case. There is evidence to suggest that autistic people produce less natural melatonin, a hormone which, put simply, is the brain’s signal to make us sleepy. Some accounts by individuals with ASD suggest that sleep is a frightening concept- a fear of the unknown and of loss of control. Finally, there is the argument that autistics, particularly young children, do not understand the need for sleep and don’t see why everyone else going to bed means that they should too. I think all of the above apply to James to some extent. I often liken him to the Duracell bunny, because he will literally keep going until his energy runs out completely. After the initial months of broken nights that everyone expects when they have a baby, James didn’t seem to be too bad a sleeper. I was a no-nonsense parent: we followed a bedtime routine. Cbeebies bedtime hour, followed by bath, milk and bed- no rocking or feeding to sleep for us. He might wake up in the night, but he generally settled back quickly. Until, at the age of two and a half, he finally figured out how to climb out of the cot, and that was it. He simply refused to go to bed, becoming increasingly hyper until he eventually passed out with exhaustion- at 11, 12- sometimes even later. During this time, Matt and I would take it in turns to camp inside his room in darkness, endlessly putting him back into bed, meaning that we spent no time together. When James woke up again, however early that might be, he was up for the day; usually jumping on our heads. Seemingly overnight, our lives had become hell, with no evenings together to speak of, and ridiculously early starts. Looking back I wonder if James really was a good sleeper at all. Perhaps, restrained by the bars of his cot, he spent a lot of time awake, but simply accepted that that was where he stayed until we came to get him out. When he figured out he could climb out himself, happy days. Well, for James at least- for Matt and I it was a different story. The sudden change inevitably took its toll on our relationship, with both of us simply gagging for sleep, unable to think logically; each of us arguing our ‘case’ for which of us was more deserving of a lie-in. My argument was that I was up for night feeds with baby Sam, so was getting even less sleep than Matt was, and I still had to work the following day. Matt, who works in emergency services and often has to drive at high speeds, countered that he needed to be alert to do his job safely. Either way, let’s face it …. surviving on hardly any sleep is complete pants. Sniping and irritability became the order of the day. 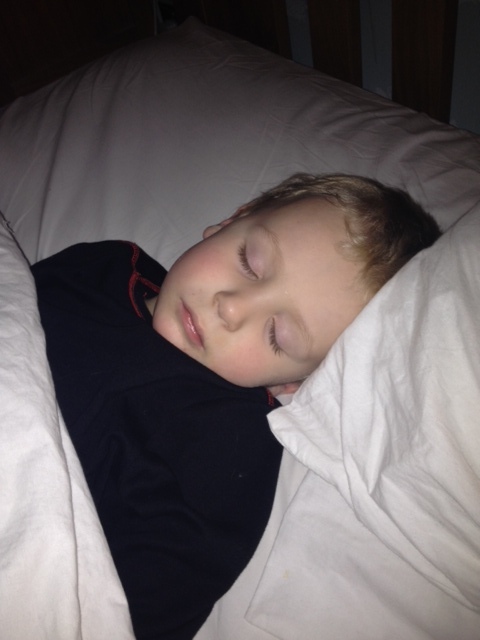 We had a slight reprieve from the nightmare after a couple of months, when we explained our situation to the paediatrician, and she prescribed James synthetic melatonin. It comes in a capsule form, which we simply mix in with some of the purée fruit pouches that James loves (he now refers to it as his ‘sleepy fruit’) and hey presto- 30 minutes or so later, he visibly calms down and is soon dead to the world. Brilliant, you must be thinking; problem solved. Well partly, yes- melatonin has helped the situation, because we now have our evenings back. Unless James has fallen asleep at all during the day. The thing with melatonin is, it isn’t simply a knock-out drug. Its role is to send a signal to the body that it is tired, and needs to relax and allow sleep to take over. But it doesn’t make you tired if you aren’t tired in the first place. We soon realised this when it became apparent that while melatonin might settle James, it didn’t stop him from waking up again at 2, 3, 4am… 5 am if we were really lucky. Giving a second dose of melatonin at this stage is pointless, because having had a few hours’ sleep James feels fresh; he isn’t tired. Never mind the fact that myself and Matt look like zombies, and plead with James over and over again that it is still time to sleep. Nope, he’s up and raring to go: and therefore everyone else should be too. 6-7pm– bath and TV time. Depending on how tired James is (I.e. how many hours he has actually been awake) he may be bouncing off the walls by this point. Around 6.45, James has his sleepy fruit. Luckily he accepts this without question as it tastes yummy and its part of the routine. 7.30pm assuming that James has made it through the day without passing out, by now he might be sitting still, if things are going our way. Often he will get hold of an object he can spin, and play with it obsessively. We prise the distractions away, and switch on ‘baby TV’. This usually has the desired effect of sending James into a trance. If you have SKY, stick it on sometime and you’ll understand why. It is spectacularly awful and makes me want to gnaw off my own arm, but it seems to work. 8pm Once we are sure James is completely asleep, we take him up to bed and enjoy what’s left of the evening. It’s about an hour, usually , before we are ready to pass out ourselves. Somewhere between 12 and 2am: a banging noise indicates James is awake and stumbling out of his bedroom. He gets into bed with us and immediately demands a drink- being wise to this, we always bring one up with us. On a good night, he won’t have truly woken up and will settle back to sleep, for now at least. (When I say settle, I actually mean fidget uncontrollably and kick the other inhabitants of the bed repeatedly whilst simultaneously knocking off the bedcovers). On a bad night: rise and shine! The rest of the night is spent taking it in turns to supervise James whilst he tears about the house; this means serving him with endless drinks, snacks and preferred televisual viewing in order to prevent a noisy meltdown, and regularly retrieving him from the window ledge, where he has managed to open a window and shout nonsense at the top of his voice to our poor sleeping neighbours. Hey, don’t they realise it’s time to wake up?! 3-4.30am assuming he hasn’t woken beforehand, this is James’ usual getting up time. Despite the fact that we’ve come to expect this, it is still like physical agony. You do anything, anything, to prolong precious shut- eye. The TV goes on, on a low volume- Teletubbies or Mr Tumble are usually good to placate him for a short while. 5.00am. We hear the telltale sound of a table dragging across the floor- James is downstairs and is attempting to climb up to undo the bolt on the kitchen door (placed there for obvious reasons- knives, toasters, ovens..). Ok, time to get up…. again, assuming we are lucky enough to have stayed in bed that long. We sit bleary eyed on the sofa, with a cup of tea, desperately trying to keep James quiet and DOWNSTAIRS to prevent him waking Sam- this is generally speaking, unsuccessful. And so the day begins. This entry was posted in Behaviour Management, Disability, Parenting, routine, Sleep, Uncategorized and tagged #ASD, Autism, Melatonin, Sleepdisorders, Sleeproutines. Bookmark the permalink.